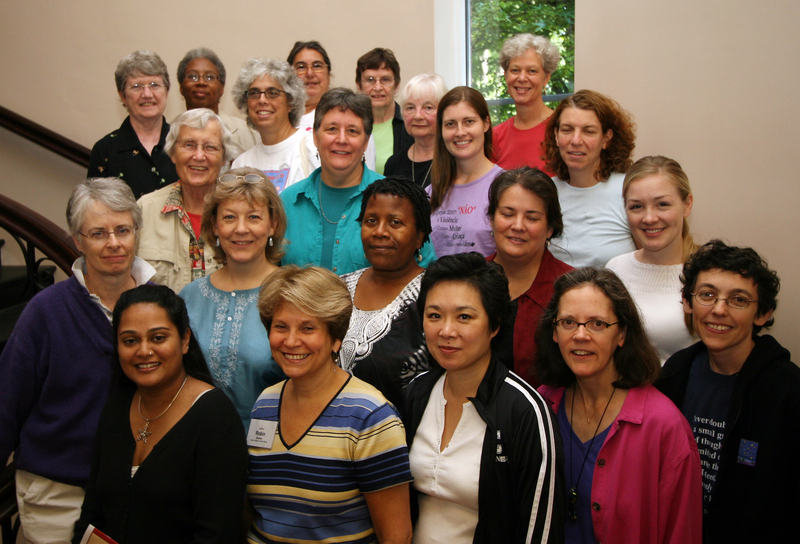 Description: This week-long consultation gathered women who are teaching in theological schools and those who are a part of religious organizations which intersect with different aspects of theological education (including publishers, educational foundations, resource centers, and women in ministry groups). The purpose of the consultation was to build connections between persons and organizations that would strengthen the educational missions of the organizations. Invited participants also spanned generations so that the question of mentoring could be addressed. Front Row (left to right): Cyra Choudhury (The Foundation for the Advancement of Women in Religion), Robin Bodner (Jewish Orthodox Feminist Alliance), Su Yon Pak (Union Theological Seminary, NY), Jeanette Stokes (Resource Center for Women and Ministry in the South, Inc.), Sarra Lev (Reconstructionist Rabbinical College). Second Row: Marie Fortune (FaithTrust Institute), *Lucinda Huffaker (Wabash Center), Jacquelyn Smith-Crooks (Office of Community Outreach Programs, Cambridge), Nancy Pineda-Madrid (Institute for Religious Education and Pastoral Ministry, Boston College), Aisha Taylor (Women’s Ordination Conference). Third Row: *Letty Russell (Yale Divinity School), Mary Hunt (Women’s Alliance for Theology, Ethics and Ritual), Kate Ott (Feminist Studies in Religion Website), Sally Gottesman (Moving Traditions). Not Pictured: *Judith Plaskow (Manhattan College).